In this post we have added best amazonian tribal tattoos and color tattoo art works. 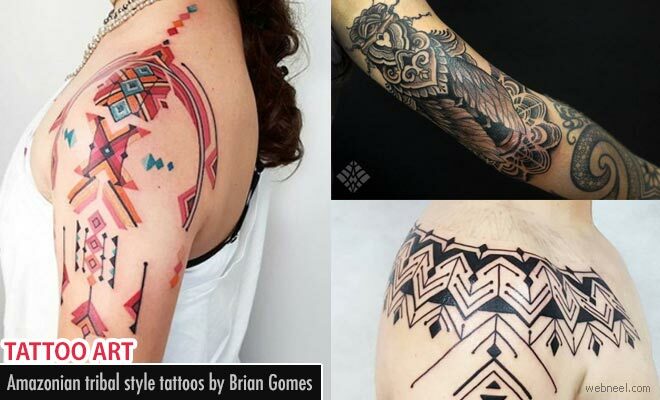 Brazilian tattoo artist Brian Gomes inspired by ethinic pattern creates Amazonian tribal tattoos which proves unique in all aspects. His tattoos are brilliant combination of design, beauty and inspiration of the area's indigenous art. The country's tribal groups from the peruvian shipibo-conibo to the brazil-based huni kuin clan contribute to Gomes creations. Gomes includes other muses of the art like pointillism, sacred geometry, the mandala symbol, and Islamic art. He mixes them all to create original neo tribal type tattoos. As an admirer of nature his tattoos include floral elements, leaves and birds along with interwoven lines, geometric and symmetrical blocks of bright colour and style. Gomes has a spiritual approach and respects the sacred patterns personal to each tribe. For Brian Gomes, tattoos are reflections of the soul and an expressions of internal beauty.